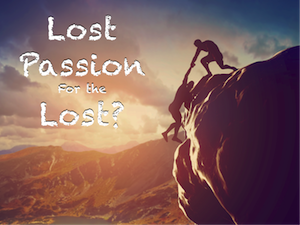 Lost Passion for the Lost? The sunrise was absolutely brilliant. Shades of red, orange and pink grew in intensity as they were painted across the blue horizon. It was nothing less than a Divine moment! As I sat before the window watching God light up the early morning sky, a prayer of thanksgiving swelled within me. I raised my eyes toward the heavens. Then, like the two mornings that had preceded it, the emotion slowly dissolved into a disturbing reoccurring question of conviction. My heart grew heavy. The brilliant colors faded. "Why?" I asked God. "Why aren't the lost, the ones who don't fully appreciate this sunrise, why aren't they more of a burden on the hearts of Christians? Why is Your plan of salvation such an issue of controversy rather than a rallying point of good news? Why?" I whispered toward the sunrise. "Why is there such a lack of passion?" This morning, as I once more sat before my window begging God for answers, the following verses came to me. I share them with you now because I truly believe they are the key to prompting a much needed revival within Christendom. "Not everyone who says to Me, ‘Lord, Lord,’ shall enter the kingdom of heaven, but he who does the will of My Father in heaven. Many will say to Me in that day, ‘Lord, Lord, have we not prophesied in Your name, cast out demons in Your name, and done many wonders in Your name? ’ And then I will declare to them, ‘I never knew you; depart from Me, you who practice lawlessness." As the Lord laid that sobering passage on my heart, I began searching for even more clarification. Then another passage came to my mind. Good Fruit or Bad Fruit? I find these passages to be disturbingly interesting because they almost seem to contradict each other. But did you notice that the second passage is actually the foundational context for the first passage? It was almost like God was answering my question by showing me the verses out of order. The first passage talks of prophesies, casting out demons and doing many wonders in the name of the Lord, yet the second passage talks of bad fruit. In other words, Christ was saying that all the good deeds done by self-assuming Christians are actually bad fruit if they have not first surrendered to the will of the Father. Read the verses again, but this time read them in order. Notice how the Lord builds His warning about bad fruit into a list of all the things we would normally associate with good fruit. The key to understanding this seeming contradiction comes from one simple phrase, "but he who does the will of My Father in heaven". All of the good deeds done by all the self-proclaimed Christians in all the world - prophesies, casting out demons, doing many wonders in the name of Christ - all of them are bad fruit if in the process they failed to do the will of the Father. The reason we lack revival, the reason we lack passion for the lost is because we refuse to acknowledge those who are really lost. The answer to my question was obvious! The reason we lack revival, the reason we lack passion for the lost is because we refuse to acknowledge those who are really lost. Without a definable group for which to be burdened, we find ourselves emphasizing the works we think are good rather than the ones the Father validates. Some years ago, I had a friend tell me that it was not our job to identify those who are lost and those who are saved. To do so would require that we judge them and, as every diluted citizen of our politically correct country knows, it's not our place to judge. 1. The Lord never told us not to judge, He told us not to judge with impure motives. 2. Even if He did condemn judging, the identification of lost souls is His call, not ours. Spiritual profiling belongs to the Lord. The Bible identifies the sinner and we, as Christ's followers, are only commissioned with announcing the judgement of the Judge. Satan has many subtle tricks designed to help Christians feel righteous without actually being right. This is one of the big ones. As long as the devil can generalize the definition of lostness and can dilute the goal of the Great Commission, our passion for the lost will also be generalized. Our mission will be minimized. Q: Can a person enjoy time on a football field even if it has no end zones? A: Sure, but the game lacks purpose. Q: Can a person enjoy time on a basketball court even if it has no goals? A: Sure, but the contest lacks motive. I fear that this is the place where much of Christendom presently finds itself, on a playing field with no definable goal posts. For the sake of the lost, we must follow God's play book! I once asked a Calvinist how he knew he was saved. He immediately began listing all the good things his church was doing and the superiority of family life within his congregation. I congratulated him, then asked a series of more probing questions, "But does your church command all that the Bible commands? Does your church teach what Peter commanded on the day of Pentecost? Does your church instruct the lost to be baptized for the remission of sins, Acts 2:38?" He paused. He swallowed hard. His face turned red, then he responded, "Well, we do baptize people!" "Yes, but do you baptize them for the reason the Father says to baptize them?" I asked. "Do you baptize them FOR THE REMISSION OF SINS?" Awkward silence again filled the air. He glanced away and shook his head. He admitted they do not. I am fully convinced that we do not see revival in our nation because we are placing our will ahead of the will of the Father. The greatest hypocrisy at work in the world today is false prophets masquerading in sheep's clothing. They preach the message of human wisdom. They emphasize everything but total surrender to the will of the Father. They create doubt about God's clearly commanded plan of salvation and, in the process, they lull their followers into a false sense of security. Satan is not intimidated by compromising Christians. He loves it when the pews are filled on Sunday morning. He wants nothing more than to have masses of people assemble to hear lengthy messages of half truths. Know this, good works do not threaten the satanic agenda of this world. As long as the devil can keep us believing that we are saved by our own understanding rather than total surrender to the will of the Father, he wins. The sunrise was brilliant. All I wanted to do was enjoy it, to just sit there and soak up all the Divine warmth. But as I reclined in my easy chair, conviction flooded my heart. The message must be spoken! The lost must be found. SELF-proclaimed Christians must be aroused from their false sense of security. I heard the voice of the Lord, saying:“Whom shall I send, And who will go for Us?” Then I said, “Here am I! Send me." Will you join me? Will you too whisper the prayer of Isaiah? Will you resolve in your heart to surrender with uninhibited obedience? Will you exhaust yourself encouraging the rest of Christendom to do the same? Will you? Back to Top of "Lost Passion for the Lost?"